Raghu Narasimha Sampath did Ph. D. Degree in Alankara Sastra. After a long span of 34 years service in the education he retired in 1984 as the Head of the Department of Sanskrit in the Presidency College. He also had initiated as the Head of the Govt. Oriental Manuscripts Library for four years in addition. In the Kuppuswami Sastri Research Institute, he served as Sastracudamani Professor for three years (1989-92). He was closely associated with the NCERT (National Council for Educational Research and Training) for number of years for preparation of text books. He is the Asst. Editor of 'Goudiya' an organ of the Madras Goudiya Math. 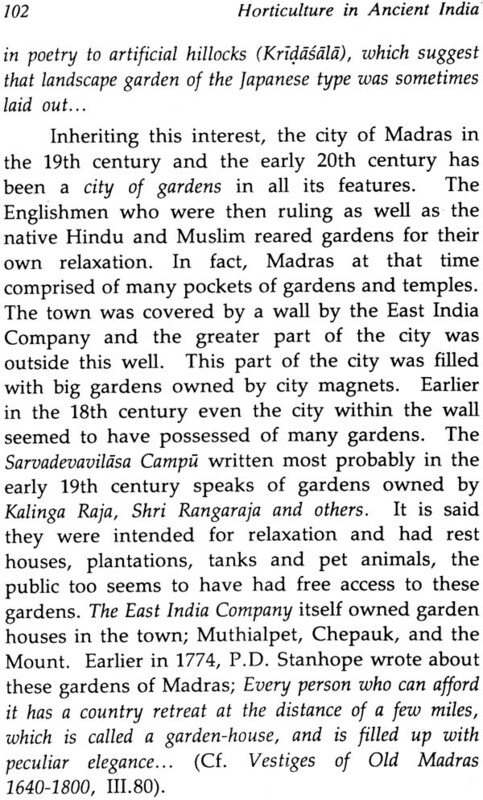 Regular reviewer of Hindu magazine, madras. He has covered number of books on Sanskritic and Indological studies. He has given more than 50 talks in the All India Radio. He is awarded the President's Certificate of Honour in the year 1997. I have great pleasure to present this volume of Golden Jubilee of India's Independence Series of Rashtriya Sanskrit Sansthan to our esteemed readers. The Volume verily represents the goodwill and cooperation, the Sansthan has all along been receiving from the distinguished scholars all over the country. The Sansthan was established in October, 1970 as an autonomous apex body under the Ministry of Human Resource Development, Govt. of India with a view to promoting, preserving and propagating Sanskrit learning in all its aspects, with special reference to the in-depth shastraic learning. Apart from conducting the regular courses of studies at the constituent Vidyapeethas, it has been bringing out invaluable publications representing dissemination of knowledge contained in the various Shastras. Thanks to the continued help, encouragement and support from the Ministry of Human Resource Development, Govt. of India that the Sansthan has grown in leaps and bounds and has been able to render its services to promotion of Sanskrit learning at national and international levels. Sansthan has decided to bring out 50 scholarly monographs by eminent Sanskrit Scholars of different fields as part of the academic programmes being organized to celebrate the Golden Jubilee of India's Independence. 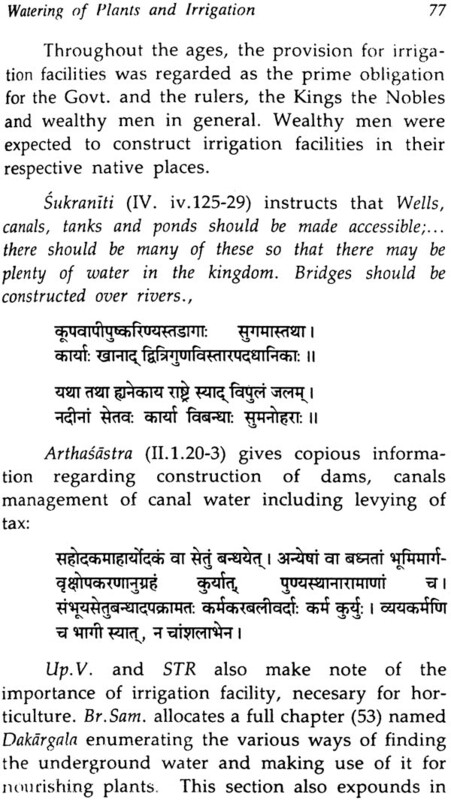 Sanskrit literature contains various types of scientific and technical knowledge useful for human welfare from ancient time. 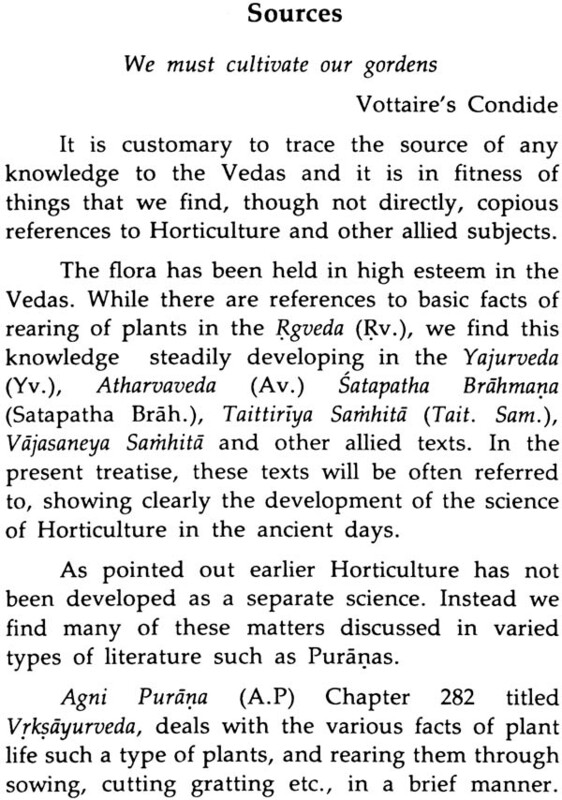 The present volume Horticulture in ancient India is one such book dealing with the practice of rearing of plants and trees in a scientific manner as revealed from ancient literature like the Vedas and Vedangas. The book will be useful for Researchers, Indologists interested in ancient scientific knowledge in general and agricultural scientists in particular besides general readers. We are highly grateful to Prof. R.N. 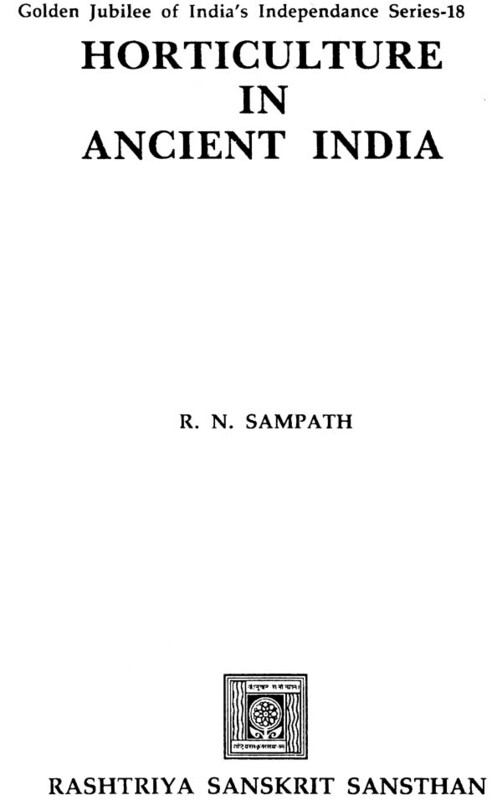 Sampath former Professor and Head, Department of Sanskrit, Presidency College, Madras and Recipient of the President's Certificate of Honour for presenting this beautiful volume to the Golden Jubilee of India's Independence Series being published by the Sansthan. 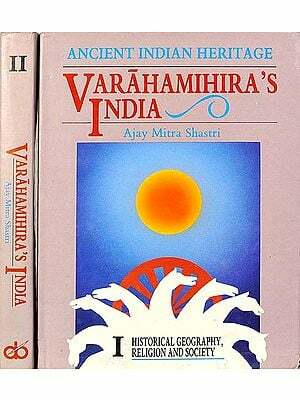 We are also grateful to Dr. V. Kameshwari for assisting Prof. Sampath in preparing this valuable book. The services rendered by my colleagues specially by Dr. Savita Pathak and Dr. Viroopaksha V. Jaddipal deserve special appreciation who have been working day and night for planning and organizing the various programmes connected with the Golden Jubilee Celebrations, particularly the publications of the golden Jubilee Series. M/s Amar Printing Press deserve our thanks for bringing out this monograph on time. 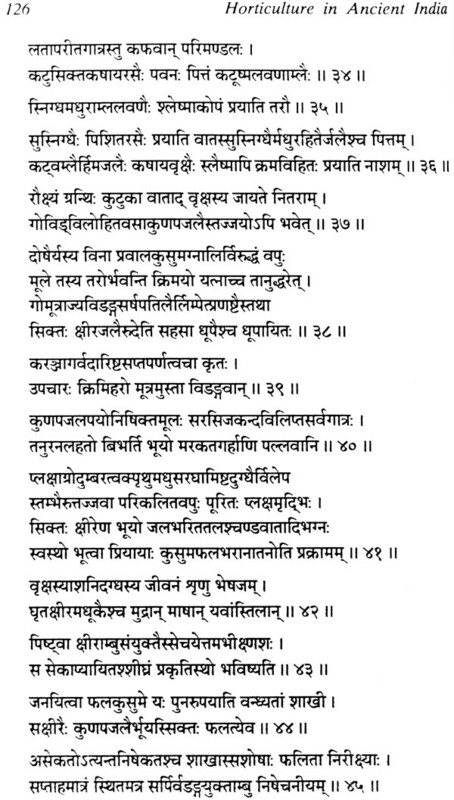 The literature in Sanskrit is singular for the fact that cannot be treated as mere literary work, a philosophical rumination or speculative treatise. They combine all in one. Knowledge about any subject has to be traced back to the vedic times and the entire literature available has to be referred to in order to procure the details available on that particular subject. 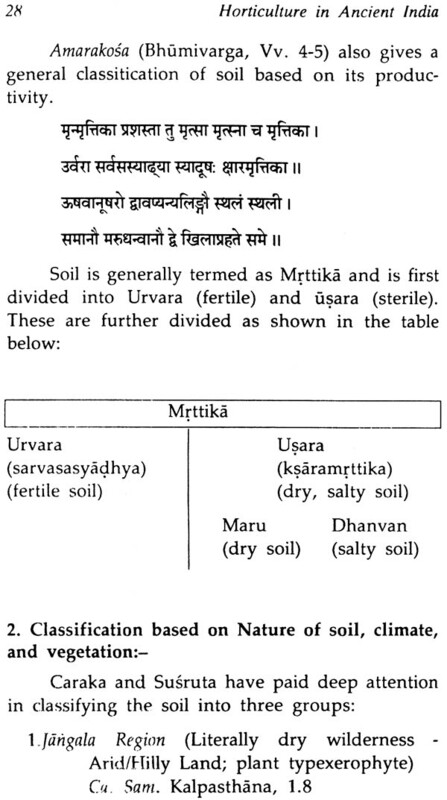 In this connection, researches so far conducted by inland and foreign scholars, show that Sanskrit literature contains valuable and dependable scientific knowledge and truth. 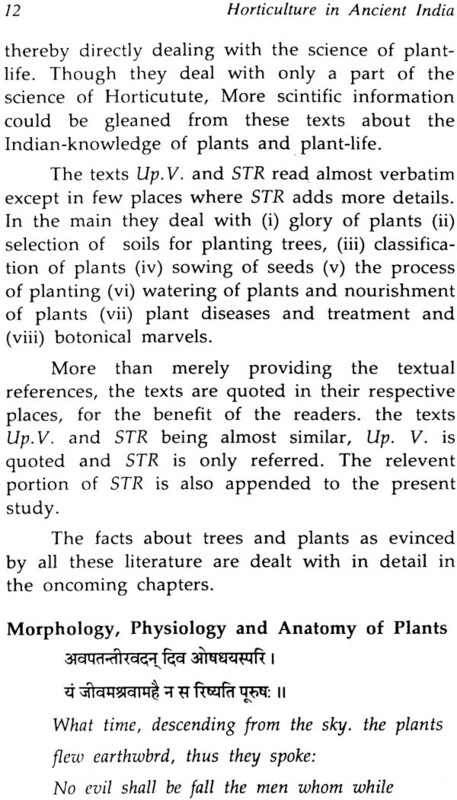 The present theme of the science of Horticulture-study of trees and plants has also been the target of research for a few decades. Dr. B.N. Seal and G.P. Majumdhar have done pioneering service to this field of study while many other scholars have contributed to this topic from different points of view. 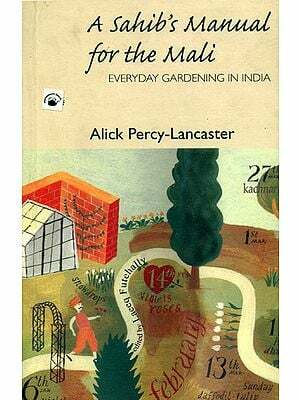 In the present treatise attempt has been made to harness to the maximum extent, all the references available regarding Horticulture in its various dimensions and also the contemporary and modern views about the same. 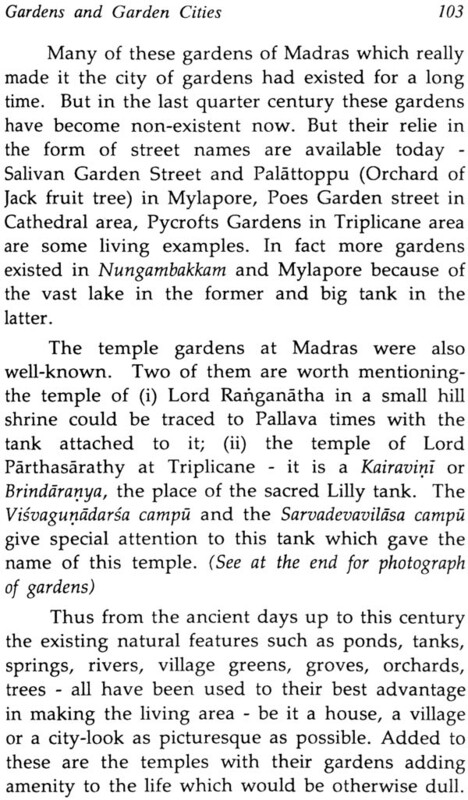 In this attempt it is my duty to thank the staff of the Kuppuswami Sastri Research Institute, Mylapore for their unstincted and unremitting co-operation at various levels of the preparation of this book. I cannot adequately thank my old student and present Editor of the Kuppuswami Sastri Research Institute, Dr. V. Kameswari for her co-operation and the assistance she has rendered in the formation of this book for which I have made her the Co-author of this book. It is highly fitting that I should exhibit my indebtedness to my friend Dr. K.J, Mishra, Director, Rasthriya sanskrit Sansthan, New Delhi, for offering me the opportunity to write this book under the Golden Jubilee of India's Independence Series of the Sansthan. 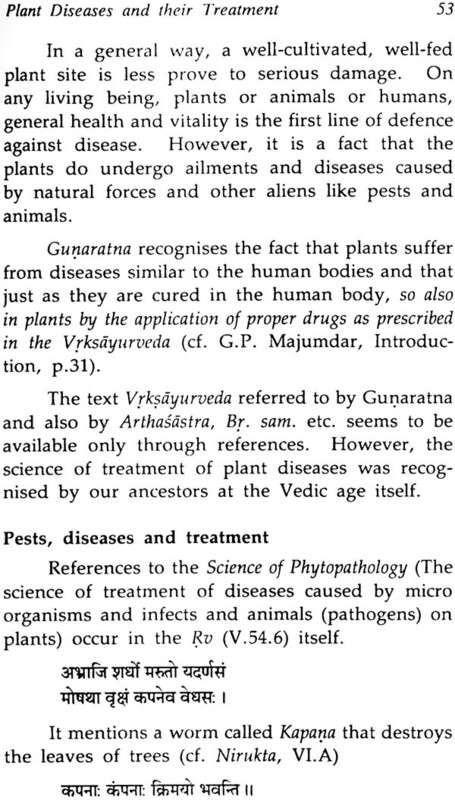 Horticulture is not a gift of the modern science at least in India. The carving of an Ashrama or a Gurukula out of a portion of wild and natural forests, with the rehabilitation of trees and plants in an aesthetic and functional manner along with the row of trees offering plenty of shades for the people to move about and the students to study and educate themselves, indicates the beginning of nucleus of the science of rearing plants and trees. 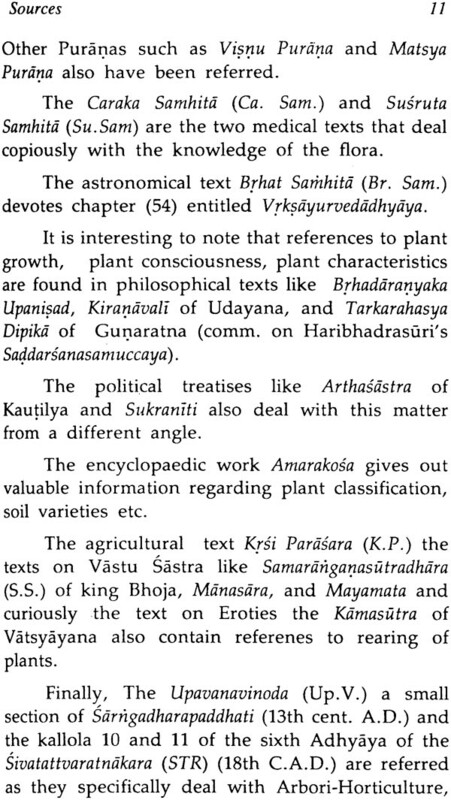 This book Horticulture in ancient India attempts to trace the practice of rearing of plants and trees in a scientific manner from texts as old as Vedas and later texts like Arthasastra, Sukranitisara, Astanghahrdaya, Caraka Samhita not excluding Brhatsamhita. 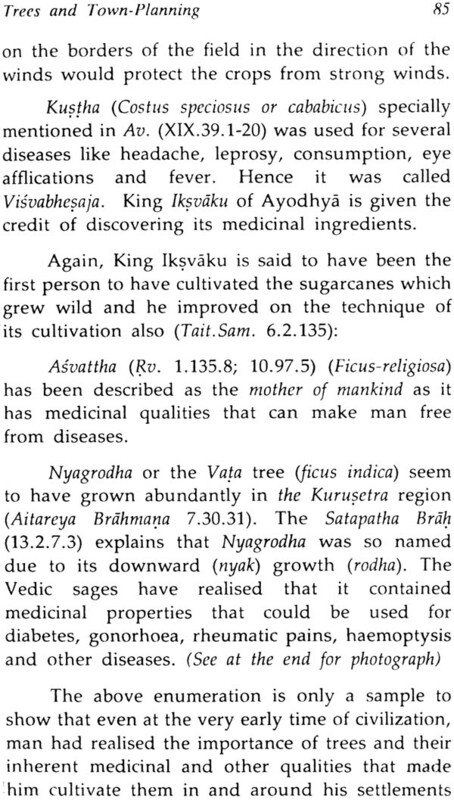 In this context, it is pertinent to note that the vedic man when he gave himself unto Ayurveda for the prophylactic as well as after cure treatment, gave to the trees also Vrksayurveda for the same consideration. By this it should be noted that the earlyman had more consideration for the preservation of nature and a very good knowledge of ecology than the modern man. To us may herds and forest-trees, be gracious gracious the lord victorious of the region. The philosophy India, of any branch and the traditional life point out to the concept that the human being is part and parcel of the Universe that ,comprises the animates and inanimates. That is the universe as such, is dichotomous in its animates and inanimates. That is, the universe as such, is dichotomous in its form as cit and acit. Cit is further divided into four groups, namelly, sura, nara, tiryak and sthavara - the divine, the human beings, the fauna and the flora. The first three are different from the last as they possess mobility in appositon to its static position. But the last three form a single group of visible and observable creation. The human being is positioned at the top of this ladder of creation; but is does not mean that he is different from the others. The Vedantic term samsara (metem psychosis) ensures the one-ness of all creations under the eye of the Supreme Lord. 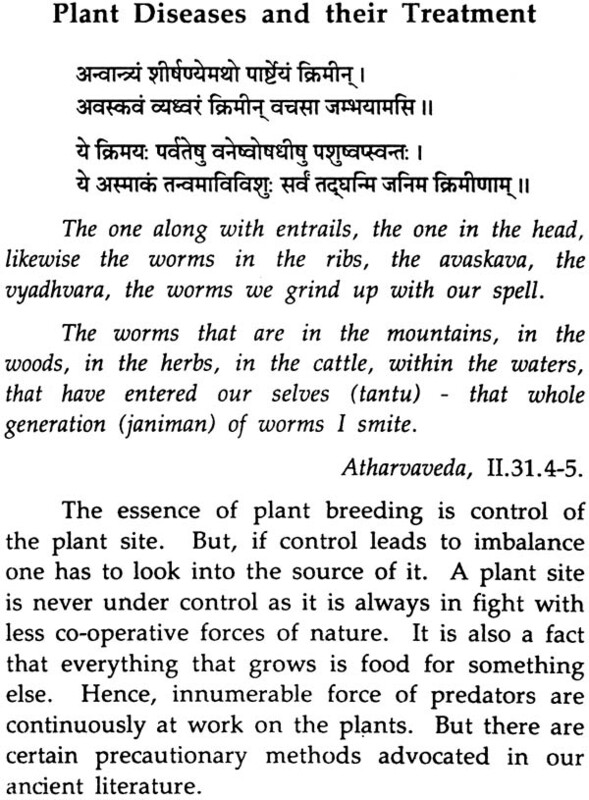 In reality, the flore or the plant-kingdom is the substratum for the development of all beings by providing subsistance of food directly or indirectly. Man has been in communication with nature from time immemorial. He has subsisted to a great extent on the plant-kingdom. The plants and trees have provided him with food, fodder, medicine, timber, clothing and shelter. 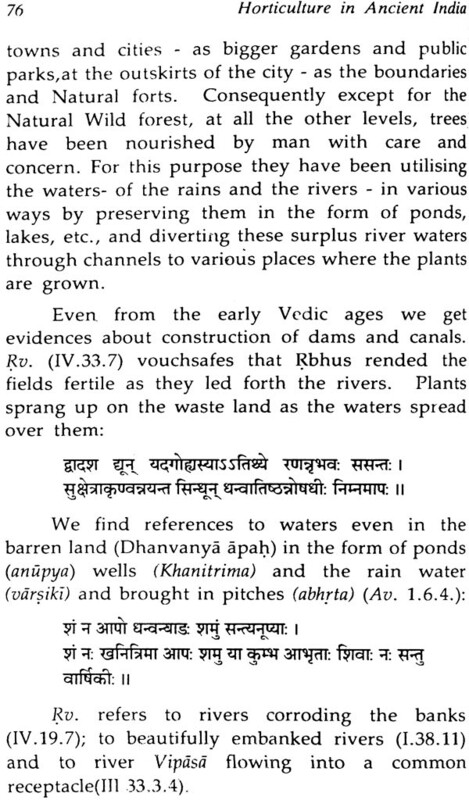 The Vedas, Upanisads and other scriptures also vouch for the enviable nature of the gift of plant kingdom with all the potentialities of creation. 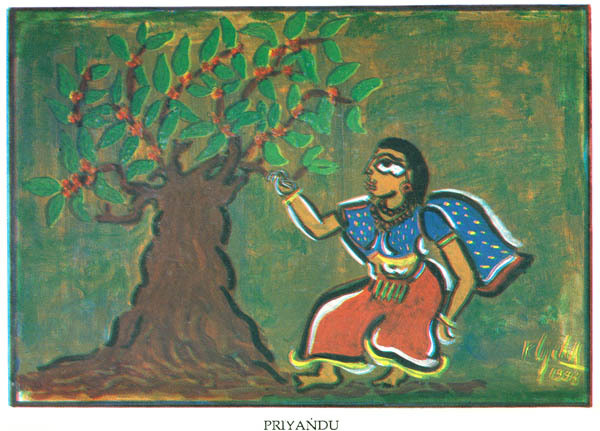 In fact, the Aranyani sukta (Rgveda. X. 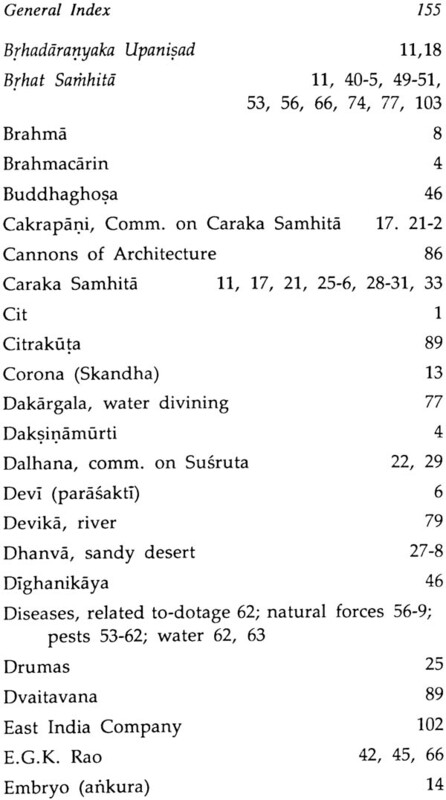 146) and the Osadhi Sukta (Rv. X. 147) glorify the value of plant - kingdom. 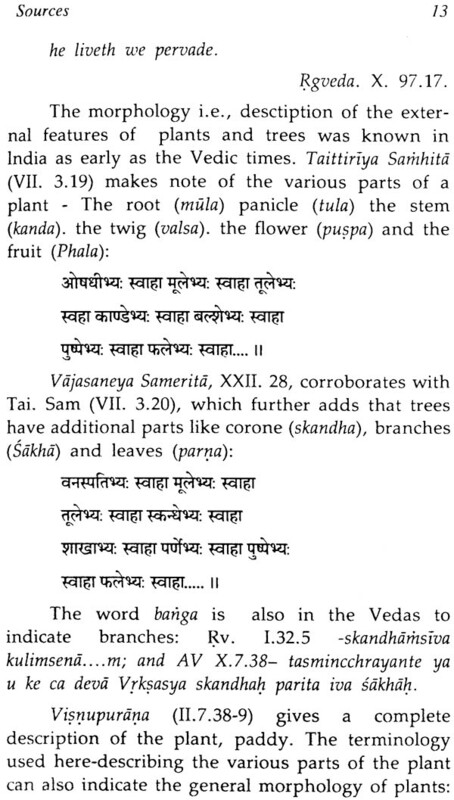 Further the term vegetation udbhid has been used to indicate the entire universe and the creator has been described with the analogy of a tree as: He alone, like a tree, stands unperturbed in the divine space-Vrska iva stabdho divi tisthatyekah (Svetasvatara upanisad, III.9). 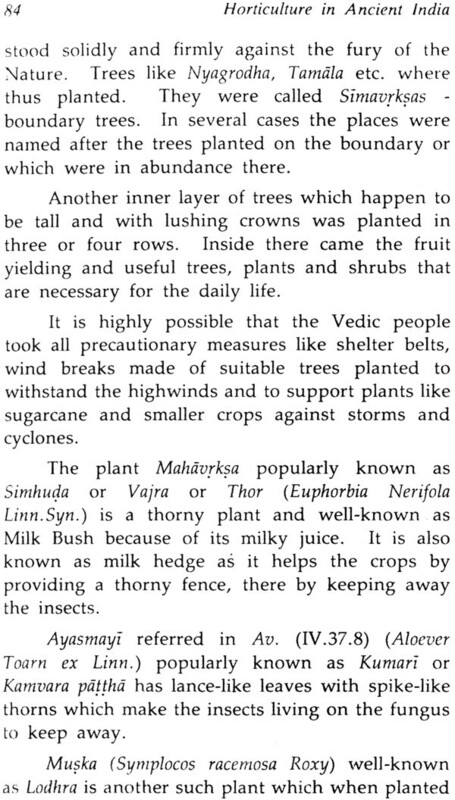 The Atharvaveda hails the trees and plants along with Gods, Vedic scholors and sun to deliver us from sins. This oneness of all creation has been the strong base of the philosophy and practice of the East in direct contrast to the attitudes of the West which exploits the rest of the creation in view of the adage man is in the image of God. But plant-kingdom forming a section of this Universe, Their mutual inter-relation and inter-action with the humans is worth studying. 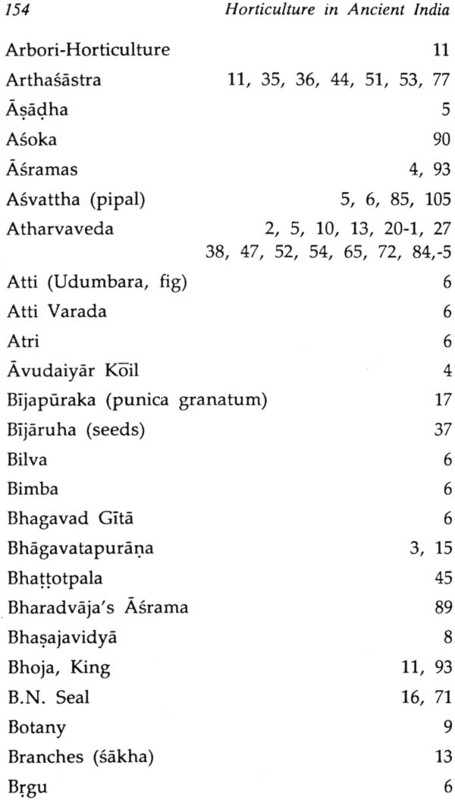 Social Position of Trees and Plants in India: Visnupurana (1.14.2-4) and Bhagavata Purana (IV. 24.13) narrate the story of king Pracinabarhis who in order to perform the yajnas, was denuding the forests and spreading the Kusa grass in their place. This was most probably the first attempt made at creating settlements by removing the trees. The story of Pracetas, son of King Pracinabarhis is a definite record of this practice (cf. Visnupurana I. 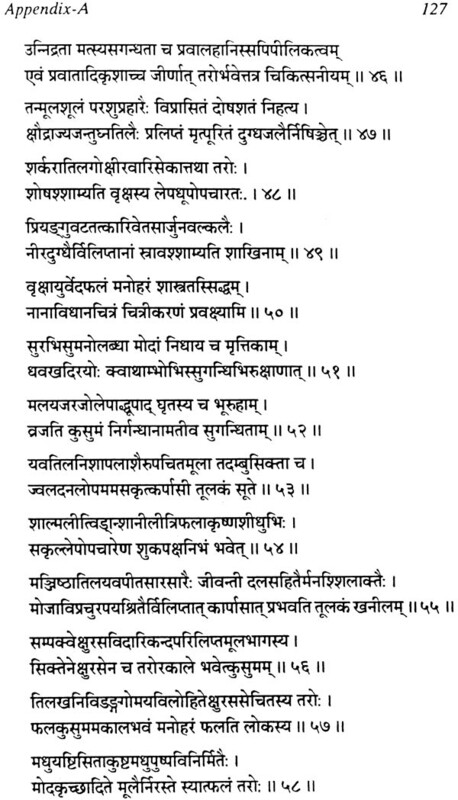 14-15 and Bhagavata, IV.30.14-47). Pracetas, was doing penance for thousands of years together, When he was thus engaged, Visnupurana (1. 15.1-8) records, that the earth was covered by huge trees and the subjects suffered; the well being obstructed with branches of the trees, the wind did not blow and mankind did not labour. Finally when Pracetas carne out of the water he got angry beholding the earth, covered with trees and no habitations. In a fit of anger, for the well-being of the mankind, he demolished the forests who in fright gave their daughter Marisa (alias Varkseyi) in marriage to him and saved themselves. 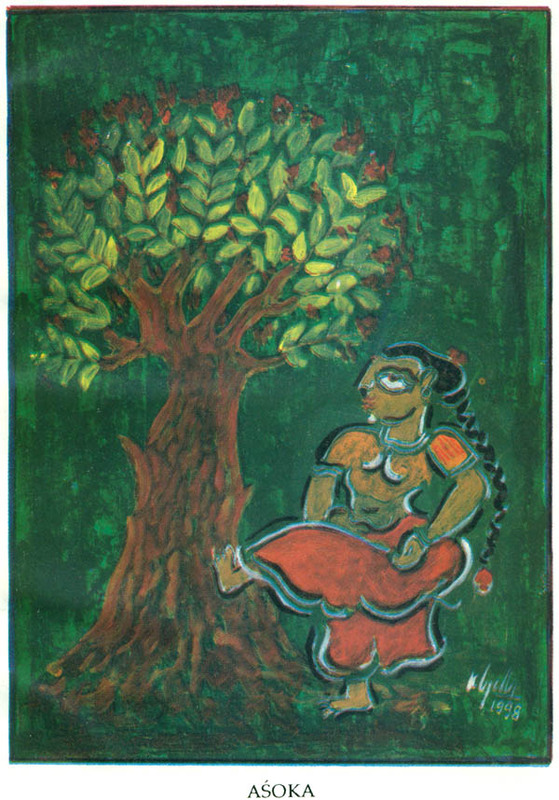 If taken symbolically the marriage would mean pleasure and can be taken as the beginning of taming of the wild trees, reclamation of land for settlement and the beginning of the harmonious living of the human beings with and amidst nature.